On March 23, during Women’s History Month, John Jay hosted the first-ever Symposium on Women in Law Enforcement, sponsored by the John Jay College Department of Public Safety and the FBI-New York Office, and with generous support from Siemens Corporation. 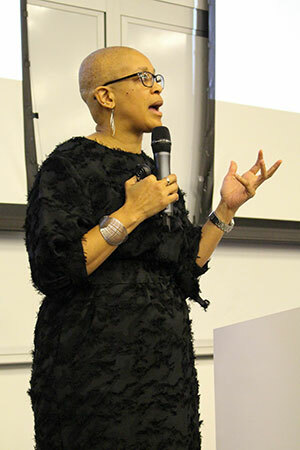 The daylong conference featured presentations from invited guests and John Jay faculty members on current topics in the field, including cybersecurity, community policing, and the opioid crisis. In attendance were alumni and students, as well as women employed in law enforcement, some of whom traveled from out of state to network and receive professional development on navigating the largely male-dominated field. John Jay faculty members Dr. Mangai Natarajan and Dr. Rosemary Barberet highlighted gender disparities in the criminal justice world, as well as the obstacles that contribute them, including maternity-leave issues and a lack of upward mobility for women. Barberet, who is editor of the journal Feminist Criminology, also announced the launch of a special issue that examines the experiences of women in criminal justice professions. Dr. Tracie L. Keesee, Officer of Inclusivity and Diversity at the NYPD, pointed out that today, 18% of the NYPD is comprised of women. But despite this sizable number, women still face several challenges, including being given a disproportionate amount of administrative work, regardless of their strengths and interests. The office Keesee works for, which was developed at the beginning of 2018, seeks to eliminate those obstacles. Conference attendants also heard from women whose experiences in law enforcement opened the door to a range of related careers. Sarah Bynum, Director of Security at Siemens Energy, spoke about utilizing the skills she gained after 20 years of enforcement experience to enter the world of security. She now handles physical security, intellectual property protection, and crisis management at one of the largest industrial engineering companies in the world. “If you can solve a house burglary, you can solve anything,” Bynum said.